Dallal House was built in 1826. Formerly, it was an old church and a monastery and now it is converted to a hotel. Grandsons of our grandfathers, the inhabitants of Al Cham land with a technique, profession and skill to enjoy in the room and landscapes of the hotel. Beit al-Dallal is a courtyard house in Aleppo Syria. 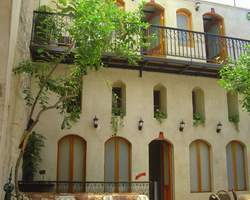 Beit al-Dallal is also known as Beit Dallal or Bayt Dallal Hotel. Completely furnished private bathroom, Colorful TV with satellite for each room, Sound systems, 24 hours service per day, Children nursemaid at request, Wireless Network.